I had a rather humbling experience recently. Someone I know in the perfume community decided to put some of his extensive collection up for auction on eBay. I was a complete neophyte, never having used eBay, since I was wary of scammers and buying from “stores” that may or not be on the level. However, knowing what his collection was like I signed up and eagerly went to his page to place a bid. Surely there was something in that stash I could afford, right? Why, look at that, something I love under 20 bucks, and bidding is slow, I might score it for under 30, let me just – hey! Who outbid me by twice as much with only three seconds to go? Rinse and repeat a few more times with several more bottles, and pretty soon I knew I could not run with the big dogs. The blood was in the water and the sharks were circling. The scents were all of quite recent origin and from prestige niche houses, what was I thinking? Now I realize it was a blessing in disguise, because once I was done licking my wounds I thought I might as well look around and see what else was on there from other sellers. I had a list of things I had been meaning to look for anyway, and they were not all that much in demand as far as I knew. I vowed to do business only with sellers that had a long history and high approval ratings, and off I went. I splashed a generous amount on my arm and went about my day. It was a fresh, aldehydic and slightly soapy floral, so familiar yet not so, since so many years had passed. A hint of spicy carnation added interest at the opening, but over time it had softened, and the fragrance was very round and gentle. I had already put another, stronger perfume on earlier, so I did not expect it to assert itself very much, but it did indeed, catching my attention every so often, and it was lovely as it settled in. Hours later, when I went to bed, I laid my head on my arm and –wow, what was that? A radiant accord of neroli and mandarin had fused with my skin and was glowing with the burnished depth of amber and sandalwood. I could hardly believe that the innocent little ingénue I had applied earlier in the day had turned into a temptress by night. The more I smelled it the more enamored I was. Another application with no competition confirmed its qualities. Many years ago a very dear friend who wore nothing but Wind Song told me that she had thought of trying another perfume, but her husband would not hear of it – he was crazy about Wind Song and bought her a new bottle every year. At the time I thought maybe she should branch out anyway, just to try something else, but after my revelation I know exactly why he loved her in Wind Song. It’s just like the slogan goes: “I can’t seem to forget you” – a truly romantic fragrance. From Fragrantica, the composition is as follows: Top notes are coriander, orange leaf, mandarin orange, tarragon, neroli, bergamot and lemon; heart notes are cloves, carnation, orris root, jasmine, ylang-ylang, rose and Brazilian rosewood; base notes are sandalwood, amber, musk, benzoin, vetiver and cedar. The newer formula is much sharper on top than mine, but I don’t know how much of that is the natural breakdown of the top notes and what can be attributed to a reformulation. However, most of these notes are easily discernible in the vintage, so it has probably not been bowdlerized as much as some older scents have when they are reworked. It’s the wonderful drydown that really sets it apart; I had no idea what a beautiful symphony of orange essence this perfume was. I will wear it with pride, right alongside the pricier perfumes in my collection. It has earned its place. 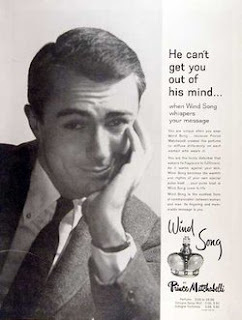 Image credit: 1959 Wind Song ad via shopstyle.com. This bottle looks very much like mine, isn’t it adorable? I didn't wear this one and I don't have any memories of it on others; like Canoe by Dana it seems it was a nice mid-priced scent that's slammed because of the perceived cheesiness of the ads for it. I loved and wore this in the 70's. I can clearly remember its scent, and I loved the little glass bottles. I haven't tried it in years, and didn't realize that they'd changed from glass to plastic to a totally different style bottle. I wonder if I should try the new version, or just keep my pleasant memories of the vintage? It has a charm and beauty all its own. The bath oil was divine; those green glass vintage bottles [ I never owned one ], crown-shaped- were beautiful. Must go haunt ebay for some vintage Wind Song... I do really love carnation. I've been finding that if you don't get too hung up on "Sealed" and "Boxed" and "Mint," you can find some real gems of vintage perfume on ebay, particularly the better-known scents that are still in production as mere ghosts of their former selves. Just last week I snagged a little bottle of Toujours Moi parfum (my bottle was produced by Max Factor, not by Dana). I haven't tested it yet, but it certainly smells lovely in the bottle. And I have a few bottles of 70's-era pdt Emeraude that are simply To Die For. Great story and review, Donna! I love it when folks revive the reputations of perfumes-gone-by -- especially when they are still readily available! Chaya, I never tried the bath oil, but I can imagine how good it must have been! Mals86, they are out there. I "watched" a sealed, "mint" bottle of vintage Coty Chypre (YES! )on eBay just to see how far beyond my price range it ended up to be. Oy. I have no qualms about opened bottles as long as the stuff is still good and the price is right. It's probably the only way I will ever get most of my vintage lovelies! It looks like Dana and/or Parlux will corner the drugstore market for license-expired frags pretty soon, so get 'em now! I remember Tabu lipstick, it was flame red and scented with Tabu perfume, believe it or not- and when I played dress-up with it, I got a rash on my lips! Maybe that's why I still can't do Tabu! Thanks Alyssa, it is so enjoyable to rediscover these fragrances. Wow - a real prince! Who knew? I don't really remember this one, but am going to go check it out immediately on ebay. Sounds gorgeous! And I *love* inexpensive vintage finds on ebay (although it always weirds me out that scents from the 80s and even early 90s are now considered vintage). What a wonderfully rich tribute! I wore Wind Song before anyone cared enough to "not get me out of his mind." And Chantilly and Emeraude, too, although I loved Wind Song because it wasn't quite as sweet. Wow. I can remember the shelf in the drug store, too. . .